​After the chaos of the NAB show in Las Vegas I needed a bit of open space, Matt and I travelled out into the desert with his drone, a pile of video kit and very nice Dodge Challenger hire car. We wanted to find a dry lake bed to stretch the rental's legs and have a play with the cameras, Google came up with Jean, Nevada, only 30 miles away. I hadn't brought any sound kit, or even a fluid head tripod on this trip across the pond, so we planned a short sequence and put together a shot list utilising the gear we had. The dry lake bed was an amazing location and the light, stunning as we worked through the later part of the afternoon. I was amazed how good the footage is from the drone, Matt has really developed a great technique with it, I will be offering aerial video/stills using drones to clients in the UK soon. 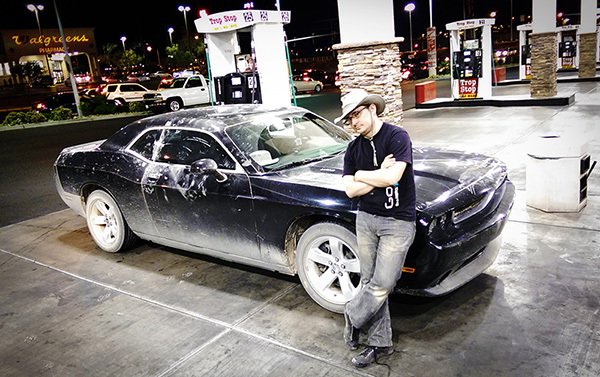 Matt filling up the Challenger in Vegas before running it through the car wash. The car ended up in a bit of a state, we toyed with the idea of pulling up at the valet parking outside the Aria, but in the end opted for the car wash and a feed at In and Out Burger. Next morning Matt got up at 5AM to drive the car back to the hire company at the airport and fly on to San Francisco, unfortunately when he went to get in it he found a flat tyre and a lot of missing tread, I guess the sand is more abrasive than we'd thought! Whilst waiting for my flight back to Blighty I edited this short cut in Premiere on my 11" Macbook Air with it balanced on my knee, I'm amazed how well that tiny thing does with 1080 footage. I did a light grade in Speedgrade when I got home to my big machine, the 11"Air's screen isn't quite up to colour work! Overall we're pretty pleased with it. I would have loved to have have my FS700 with me for super slowmo, and my sound kit, and my Miller tripod and and and......There's always next year!